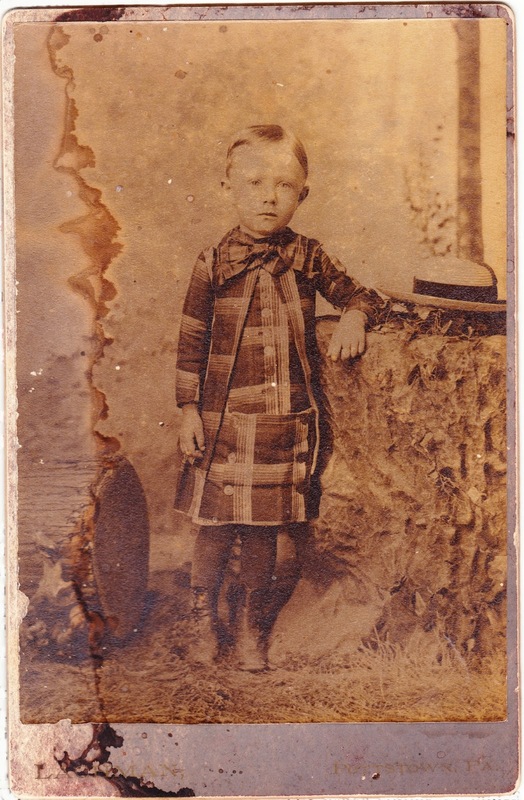 This damaged but intriguing 19th century cabinet card of a young child leaning on a fake tree stump was produced by the studio of Lachman & Son in Pottstown, Pennsylvania. There is no name for the kid on the front or back, so that will surely remain a mystery. Photographer Isaac S. Lachman lived from 1835 to 1901, and you can see his grave here. The "Son" in his business was likely William F. Lachman (1859-1909). Lachman was one of Pottstown's notable producers of CDVs (carte de visite), which where thin photos, about 2.5 inches by 4 inches, mounted on cardboard. The cards were exchanged among friends and visitors in what became known as "cardomania." CDVs pre-dated cabinet cards and were, to an extent, replaced by them. If you do a Google search for "Isaac S. Lachman," you can find a half-dozen or more other examples of his photography, including this one on the blog Who Were They? and this one from The American Civil War Museum.